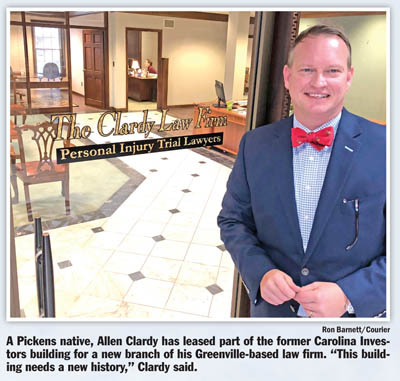 PICKENS — For the past 16 years, the imposing red brick building at 208 Garvin St. in downtown Pickens has stood empty, a desolate reminder of a painful episode that still bears scars — the collapse of Carolina Investors. It was here that some 12,000 people lost an estimated $278 million when the once-trusted Pickens-based financial institution went under amid a cloud of scandal and broken promises. 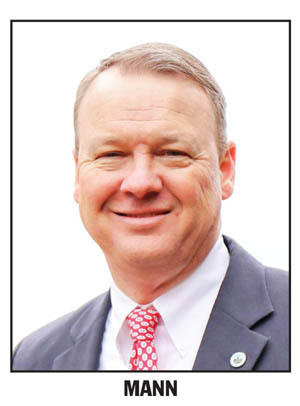 EASLEY — Mayor Larry Bagwell’s third term as Easley’s mayor will be his last. Bagwell announced toward the end of his State of the City address Thursday afternoon at South & West that he will not seek re-election. Bagwell was first elected to Easley City Council in 1979. “I’ve been blessed to be a part of this community,” Bagwell said. “I’ve served on city council for 28 years and completed my 12th year as mayor. Easley has grown and changed over that time, and I have been proud to represent my community. Easley City Councilman Chris Mann announced his candidacy for mayor a short time later. The past year was a positive one for the city of Easley, Bagwell said. PICKENS — The Pickens Bi-lo is one of four stores in the Upstate set to close. 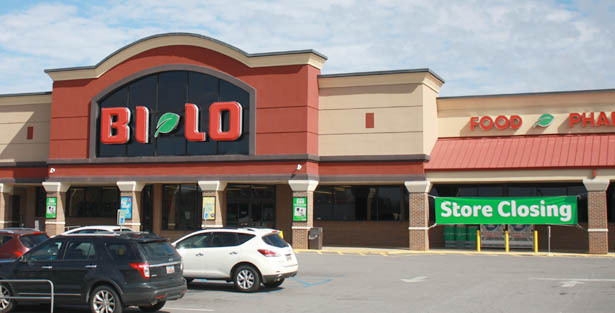 In addition to the Pickens location, Bi-lo parent company Southeastern Grocers will close stores in Spartanburg, Greenville and Greer, according to Joe Caldwell, senior manager of corporate communications. The four stores were underperforming, he said in a news release. I got some sad news from my best friend Allen Senn last week. Allen and I have been buddies ever since third grade, when we were the chief cut-ups in Mrs. Rauton’s class at Calhoun- Clemson Elementary School some 55 years ago. Allen texted me Monday to let me know that his dad, Louie Senn, had passed away at 3:41 p.m. Allen had told me just a few days earlier that his dad had been diagnosed with kidney failure and the doctor gave him just six months to live. “He is my hero,” Allen said. Louie Senn was a World War II veteran who took part in the invasion of Normandy following D-Day. He grew up poor in rural Newberry County, came to Clemson to get an education and went on to have a distinguished career with the U.S. Department of Agriculture and Clemson University. Unfortunately, he didn’t live long enough after I got the word about his failing health for me to visit him again before he died. But I got him to tell me his war stories a few years ago, and I’m going to relate some of that to you in a minute. First, though, I want to tell you about the adversity he overcame as a child. EASLEY — A 64-year-old Easley man died after a fire at his home last week. Pickens County Coroner Kandy Kelley identified the victim as Donnie Rider of 113 N. 7th St.
Rider was pronounced dead at Prisma Health–Baptist Easley Hospital, she said. 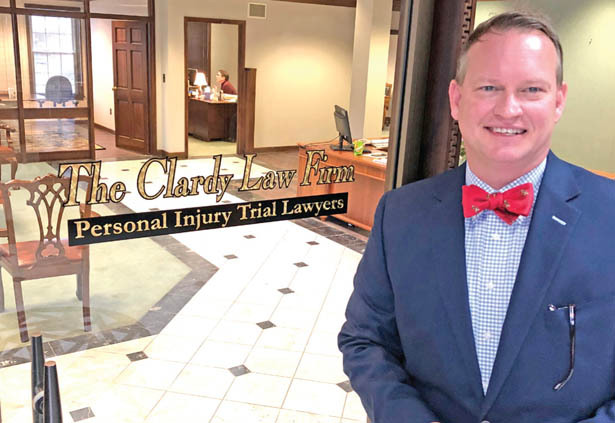 EASLEY — Easley City Councilman Chris Mann has announced his candidacy for the mayor’s seat, which will be up for grabs in November after Mayor Larry Bagwell announced last week that he will not seek re-election. 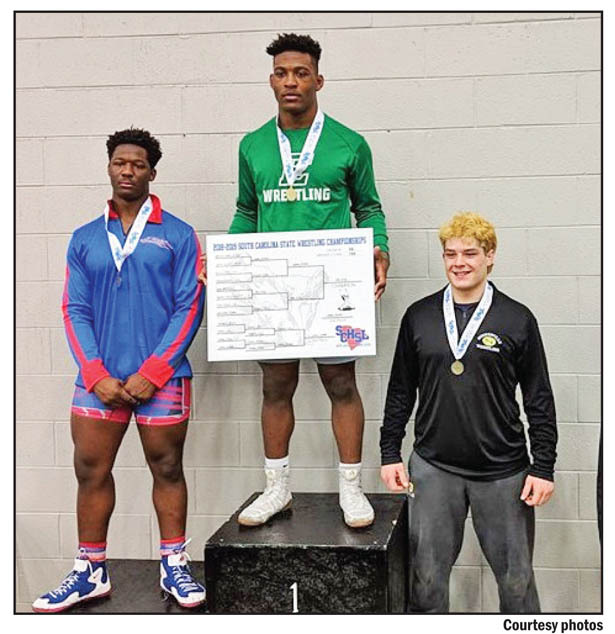 The athletes of Pickens County had another successful week on the mat, as three of the county’s top wrestlers came away with medals at the individual state wrestling championship over the weekend. In the Class 5A championship, the big winner of the event was junior Joshua Hill of Easley, above. Hill, who competed and won in the 195-pound weight division, became the first wrestler in Easley history to win a state wrestling championship. Meanwhile, at the Class 4A tournament, Pickens’ Elijah Holder, top left, came in third in the 138-pound division, while Garrett Kloth, bottom left, also came in third in the 145-pound division. EASLEY — Easley will soon be gaining a fire station. The station at Easley City Hall will be reopened, Easley fire chief Butch Womack said. Womack delivered some remarks as part of the Greater Easley Chamber of Commerce’s State of the City luncheon Thursday. 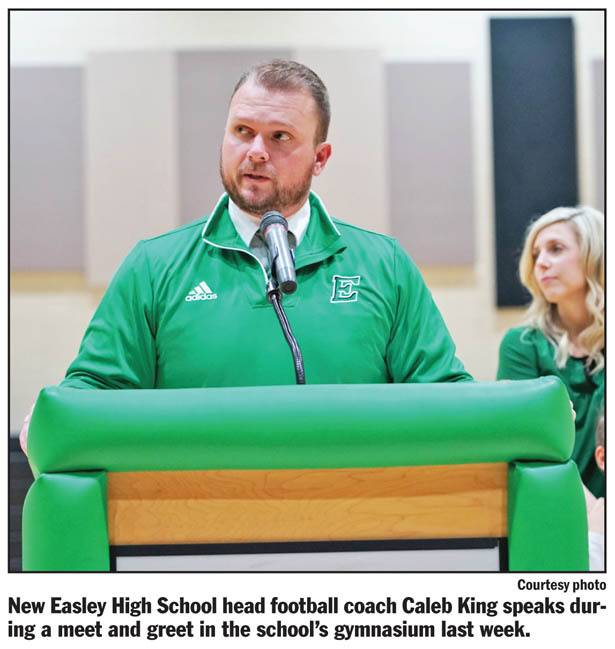 EASLEY — Hundreds of Easley supporters, fans, parents, players and administrators got the chance last week to meet new head football coach Caleb King and his family at a meet and greet in the school’s gym. King drove a U-haul truck all day to get to the meet and greet on Feb. 19. “It wasn’t as comfortable a ride as you would think it would be,” he said. 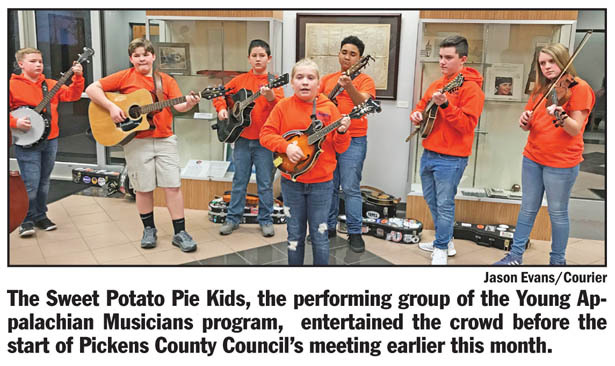 Attendees at the February council meeting had a chance to see some of the talented musicians firsthand, as the Sweet Potato Pie Kids performed before the start of the meeting. Last month, the program held its 10th annual Winter Bluegrass Jubilee, an all-day bluegrass concert fundraiser. Council chairman Roy Costner read the resolution aloud after the vote. 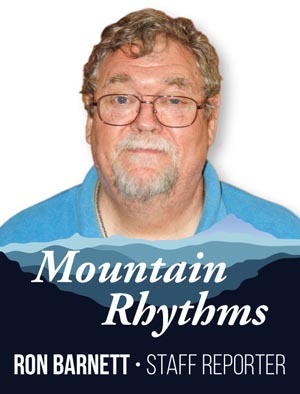 “As county council, we recognize Southern Appalachian music as being such an integral part of our heritage and our culture,” Costner said. Under the leadership of director Betty McDaniel, the YAM program has grown to include more than 300 third- through eighth-grade students enrolled in afterschool programs at 12 schools in Pickens County, the resolution said. The resolution recognizes the “hard work and continued success” of the students, volunteers and organizers of the YAM program, POSAM and the jubilee. The program’s growth and continued success “brings honor to our county, as well as recognition of shared cultural musical heritage,” the resolution said. Knowing that there more than 300 students currently enrolled in the program, Costner said he asked McDaniel how many students have come through the program since its launch.